In May, we ran the roundtable meeting, Maximising soft power assets: towards prosperity, in association with the British Embassy in Mexico and the Government of Mexico. This first Wilton Park event in Mexico also marked the 8th Meeting in our public diplomacy series and provided an opportunity to bring together 38 public diplomacy practitioners to discuss how to maximise and deploy soft power assets, particularly with a view to furthering national, regional and global prosperity goals. Keynote speakers included Professor Simon Anholt (Independent Policy Adviser) and Aturo Sarukhan (Former Mexican Ambassador to the US and Distinguished Fellow, University of Southern California Center on Public Diplomacy). 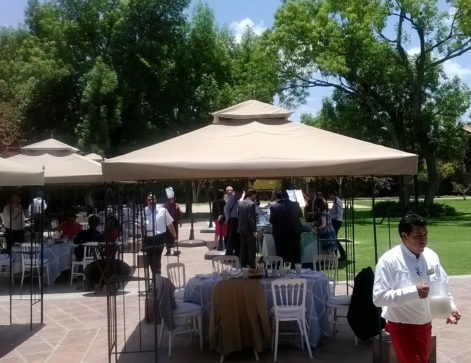 Primarily attended by British and Mexican participants, the event provoked deep discussion and provided an opportunity for policymakers and practitioners from both countries to share knowledge and ideas. The meeting was particularly timely as 2015 is both the ‘Year of the UK’ in Mexico and the ‘Year of Mexico’ in the UK. Invaluable perspectives came from other countries developing soft power strategies including Professor Dong Hwi Lee of the Korean National Diplomatic Academy. The origins of soft power were explored, with emphasis on the assumption that soft power is strongly linked to reputation both at the domestic and international level. The behaviours of states need to be consistent with their rhetoric: public relations campaigns have to be backed by authentic action. Reframing a narrative about a country can be difficult and the difference between reality and perception is a particular challenge for Mexico. It was highlighted that the media is often a hindrance to this goal. However, stories about a country’s role in development can be powerful in promoting positive perceptions and Mexico’s poverty reduction programme was cited as a good example of this. Similarly, Ania Calderón Mariscal in the President’s Office outlined the innovative use of digital to engage citizens and their communities. Diaspora populations with leading roles in business, science and the creative industries act as powerful ambassadors of their country. States are often slow to recognise this and could do more to cultivate links and amplify these voices through social media and other channels. The BBC World Service and the British Council are key UK soft power actors and Mexico could benefit from forming similar institutions to promote the Spanish language internationally and to broadcast the reality of life and the rich culture of Mexico. More could be done to highlight educational achievements and positive examples of Mexican entrepreneurship in the global market. In today’s world, power is increasingly diffused and governments need to engage with the broad spectrum of influential non-state actors emerging in the international arena. Diplomats need to adapt to this new networked reality: traditional hierarchies and top down messaging are no longer the most effective ways to bring about change and effect influence. Soft power will continue to be an important lens through which states view their actions and those of others. Wilton Park, itself a soft power actor, will continue to assist the international community in exploring the nature of this concept of influence and attraction and its application to foreign affairs policy and practice.